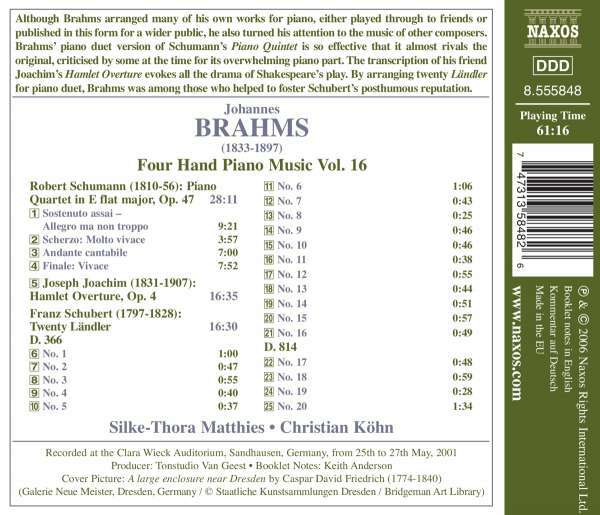 Der Artikel Johannes Brahms (1833-1897): Klaviermusik zu 4 Händen Vol.16 wurde in den Warenkorb gelegt. Although Brahms arranged many of his own works for piano, either played through to friends or published in this form for a wider public, he also turned his attention to the music of other composers. 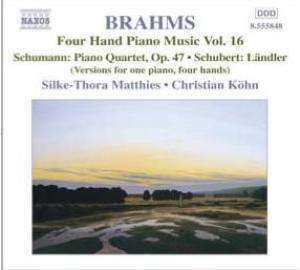 Brahms' piano duet version of Schumann's Piano Quintet is so effective that it almost rivals the original, criticised by some at the time for its overwhelming piano part. The transcription of his friend Joachim's Hamlet Overture evokes all the drama of Shakespeare's play.